Thursday morning rush hour traffic came to an abrupt halt for commuters on I-10 East Freeway. 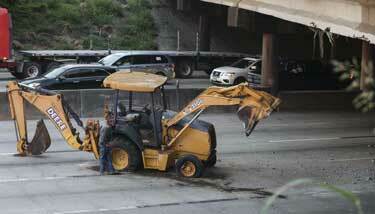 Around 6:40 a.m. Houston police responded to a construction truck in the middle of the freeway. The truck hit the low level Waco Street Bridge because the driver failed to realize that he did not have sufficient clearance to pass under the bridge. Fortunately, there were no other subsequent car accidents and no injuries were reported. The lanes were blocked off by the fire department and local authorities as crews worked together to clear the truck and scene. Drivers were advised to take 610 North bound and the Eastex Freeway as the recommended alternate route. For updated reports visit Live Houston Traffic Updates. The Texas Department of Transportation will need to inspect the Waco Street Bridge for any substantial damages as it has been hit several times. If you or a loved one was involved in car accident please don’t hesitate to contact our experienced Houston car accident lawyers. Call (713) 987-7111 or send us an email to discuss your car accident case. Accidents Involving Stolen Cars: Who is Liable?